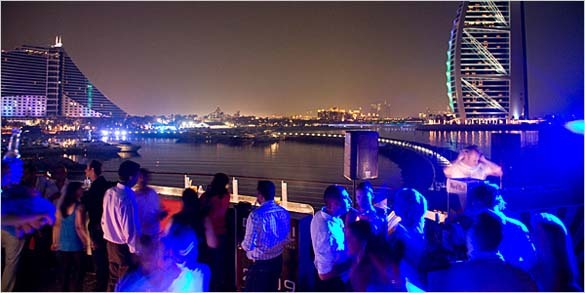 If you want to enjoy the nightlife in Dubai then no trip would be complete without a visit to the 360 Bar. 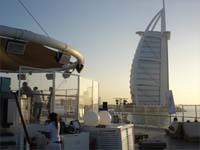 Dubai has an array or bars, clubs and pubs but there is something special about the 360 bar. The venue is located in the affluent Jumeirah area and is so unique in its location that it can be seen quite clearly if you use a mapping application like Google maps. In order to get to the 360 bar in Dubai, you need to head to the Jumeirah beach hotel, that’s the 5 star hotel which is shaped like a wave. As you walk in through the main entrance and pass the lobby, simply carry straight on until you reach the back of the hotel. You should walk past a small water feature with a piano in the middle. Keep walking straight and you’ll eventually notice that you're actually heading out to sea. As you walk along the walkway, you will notice the sound of the sea and the lights in the distance. If you look to you're right you will notice a host of yachts, some of which have been converted into restaurants. As you eventually get to the 360 Bar (and it is quite a walk), you will need to get past security, as with any pub, club or bar you would expect this. As you pass security, go up the stairs and you will be overwhelmed with the breathtaking view. The Burj Al Arab hotel can be seen in all its glory and its beautiful lights. Because it is all part of the Madinat Jumeirah resort, everything is in close proximity. The 360 bar is a circular shaped venue which means you get a complete view of the horizon and all things around it. Around the sides are sofas which have soft cushions as well as shisha pipes ready for your pleasure. In the centre of the venue is a bar with cocktails of your choice. The music that is played is generally trance, disco and club classics and the club is generally packed with British ex-pats. Overall, an amazing place to go which is very safe, has stunning views and somewhere you won't forget in a hurry. Remember, next time your in the vicinity, visit the 360 Bar in Dubai.